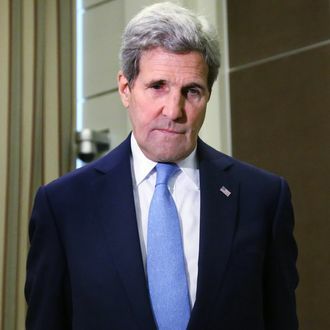 Secretary of State John Kerry plans to talk to Congress — specifically, the House and Senate Judiciary Committees — about the migrant crisis on Wednesday, explaining what the Obama administration is currently willing to do when it comes to accepting refugees from Syria. The U.S. has accepted about 1,500 Syrian refugees into the country so far. White House Press Secretary Josh Earnest said the State Department was considering a “range of approaches.” “We’re certainly mindful of the urgency around increasing the resources and response,” he added. The U.S. has provided relief in other ways, giving more than $4 billion in aid to refugees from Syria since the start of the civil war in 2011. It can often take years for refugees to make it through the bureaucratic hurdles necessary to get to the United States. In 2013, the U.S. approved the applications of 36 Syrian refugees, according to The Guardian, partly because of slowness caused by counterterrorism laws. Many 2016 candidates have also been asked about what the U.S. should do to respond to the crisis. Hillary Clinton, Martin O’Malley, and senators Marco Rubio and Lindsey Graham expressed willingness for the U.S. to resettle more refugees — or at least provide more aid of some kind. EU lawmakers will begin discussing the new plan on September 14; it is not clear whether it will pass, since smaller quotas have failed in the past.